Wow it took longer than I thought to get back to testing out these Clearly Perfect Slotted Trimmers. I had great intentions but life and the addition of some sunny days around here pulled me away from the sewing room. But yesterday I was back at it. I know when I saw these trimmers on Kari's Instagram post that they were genius tools! I made a couple of slightly oversized half square triangles. I haven't always been a trimmer but I've come over to the trimming side. 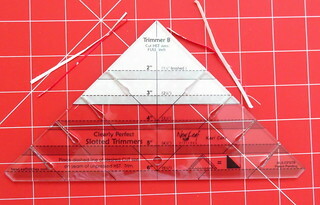 I used my regular ruler with the diagonal line, trim to sides then turn the block and trim again. But sometimes my ruler would distort the center line, or I wouldn't use the right line.. nothing that I couldn't resolve but I felt a big frustrated. So simple. 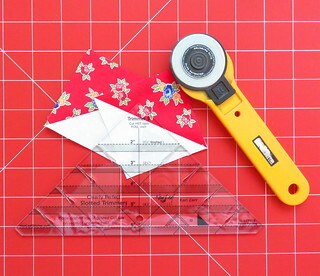 There are two trimmers in the set, for half inch squares and full inch squares. 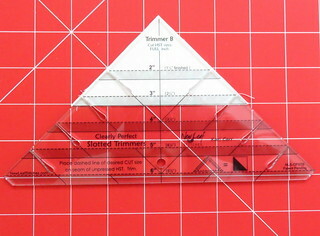 (for instance 2 1/2 inches OR 2 inches) The rulers are on a plastic coated sheet with instructions on how to use them for your basic half square triangle units and then trimming methods for quarter square units, three piece triangle squares, and block cutting techniques for strips. Seriously it's so clever. 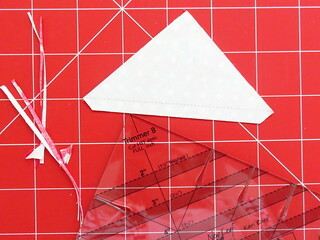 To use it you line up your stitching on the dotted line and trim your two sides. Then slide your rotary cutter into the slots on either side and it will trim off those dog ears for you. As a right handed person I easily used the right slot, the left was reaching across myself, which was a tad awkward but says to me "Pam, buy yourself a rotating mat". HOLY COW I LOVE THESE TRIMMERS SO MUCH. And since the dog ears are off, once you're back at the iron the block is ready to use. Again, genius. It just seems so much easier than what I have been doing. Ta da. Perfect squares. They even ironed up nicer this way. I don't know if that's because the dog ears are off and the tension on that seam is different or it's just my giddy perception of it. One thing I do know for sure, this is a tool that won't languish in a drawer once the novelty has worn off. Many thanks to Kari who sent it to me to try out. 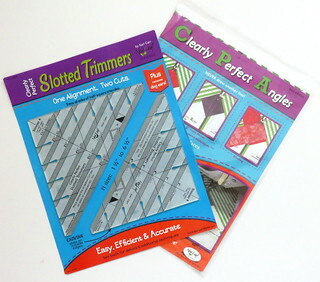 These look interesting to try, especially for a quilt of many triangles that I have coming up soon. Thanks for showing them! Great description of how to use it...I'm getting one! Her Clearly Perfect Angles tool has been useful to me for many years. Thank you for sharing this tool, Pam! Love when tools come out that make life easier and more fun. I don't like to trim either and wherever possible will cut each square to the final 'trimmed' size and just do them ECT style - no trimming at all. But that only works for the smaller sizes :)! This might be the ruler for me. Hmmmmmm, that looks way to easy! Will hit the link! Thanks for the tip!